What Can Research on Coups Tell Us About Egypt? This is a guest post by University of Kentucky political scientists Clayton Thyne. Political scientists and other scholars have amassed a substantial body of work about coups. Below I discuss what this work has found and how it is linked to the events in Egypt. The important lesson that emerges is that the coup in Egypt likely to be bad for Egypt’s fledgling democracy, but a strong response by international actors could help keep Egypt on a democratic trajectory in the long run. What happened in Egypt was certainly a coup. Jonathan Powell best explains why the military take-over was definitely a coup by summarizing definitions used by fifteen previous scholars who have previously defined “coups,” and Jay Ulfelder comes to a similar conclusion. Both Jon and Jay are right—the coup was overt, perpetrated by people from the state apparatus, and it was illegal. Of this we should have little debate. Furthermore, systematic data on coups show that what happened in Egypt is relatively uncommon. Below I plot total and successful coups over time using the data that Powell and I compiled. 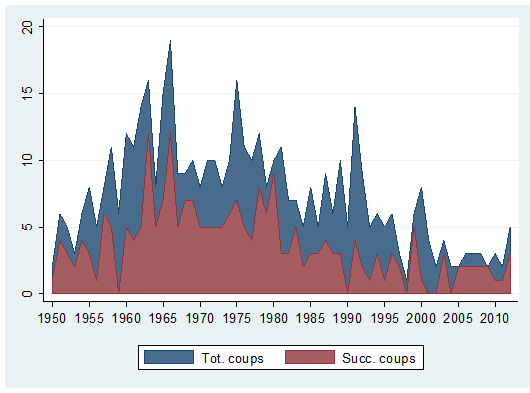 The number of coups has fallen significantly over time, although they are certainly not non-existent. There have been 40 coup attempts since 2000 (17 successful) and 5 coup attempts in 2012 (3 successful). The Egyptian coup might seem unusual because it was preceded by a popular protest, but in fact these protests regularly precede coups, as Jeremy Pressman rightly noted. Work by me and Aaron Belkin and Evan Schofer shows that popular protests are one of the most consistent predictors of coups. What does the coup mean for the future of democracy in Egypt? Powell and I show that coups can increase the likelihood of democratization when they overthrow authoritarian regimes, something that seems to be especially true in the post-Cold War era, when elections come sooner after coups according to the findings of Nikolay Marinov and Hein Goemans. But when there is a coup against a democratically elected government, like Morsi’s in Egypt, the scholarly literature is less optimistic: coups that take place against democracies are bad for democracy. So, what happens now? Most of what I have seen focuses on the internal political dynamics in Egypt (see, for example, analyses from Doug Mataconis). Internal dynamics will undoubtedly be important, but we shouldn’t lose focus on the international community. Although there isn’t a large literature on how the response of the international community matters—though see this forthcoming paper from Megan Shannon and co-authors —support from international actors appear to increase the tenure of leaders who come to power via coups. 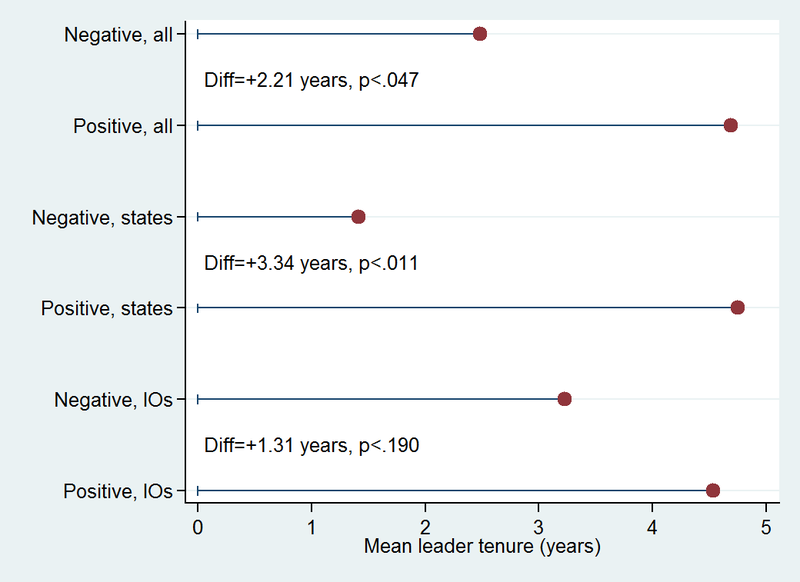 Using data from Archigos, Powell and myself, and Shannon et al., I examined 205 leaders who came to power from a coup between 1951 and 2004. When these leaders drew positive support from other states and/or from international organizations (IOs) in the six months following the coup, they stayed in power longer than when they drew mainly negative support. Leaders who came to power via a coup that was supported by the international community lasted over 2 years longer than those who came to power and were condemned by the international community. Leaders who enjoyed state support after seizing power lasted over 3 years longer on average than those who faced a hostile response. Thus, it may matter a great deal how the international community responds to events in Egypt. The African Union has already followed its rules by suspending Egypt, but there haven’t seen a similarly decisive response from many others. As should be expected from Daniel Morey and co-authors’ study of international responses to the Arab Spring uprisings, the Obama administration is all over the place (or see Joel Pollak’s rather scathing critique). Without strong international pressure in support of democracy, the military in Egypt essentially has a blank check to do whatever they want with the state. We’re quickly seeing this play out with the crackdown of supporters of the previous government and the waning hope of seeing someone like ElBaradei gain a strong position of power. A spade is not a shovel, and condemning a coup is not the same stating that “the future path of Egypt can only be determined by the Egyptian people.” Coups are bad for democracy, international responses to coups matter, and Egypt’s path towards (or away from) democracy will likely hinge upon strong international pressure to return to elections and respect the electoral outcome as soon as possible. Are the Democrats still at a disadvantage in redistricting? 13 Responses to What Can Research on Coups Tell Us About Egypt? If this is true: “When these leaders drew positive support from other states and/or from international organizations (IOs) in the six months following the coup, they stayed in power longer than when they drew mainly negative support. Leaders who came to power via a coup that was supported by the international community lasted over 2 years longer than those who came to power and were condemned by the international community. Leaders who enjoyed state support after seizing power lasted over 3 years longer on average than those who faced a hostile response.” Does it follow that democratically elected leaders who have negative support from international community and lack state support also have a lower chance of staying in power? Sorry about the delay in responding to this, Dalia. I’m 98% sure I know the answer to this…we have no idea. I think you’ll find the best work on this from folks using the Archigos dataset (Henk Goemans, Kristian Gleditsch and Giacomo Chiozza in particular). 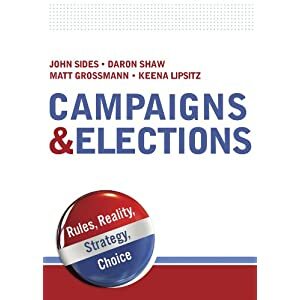 From what I have read, we have results focusing on domestic vars (e.g., regime type, civil conflict), leader characteristics (e.g., age), and some intl vars (e.g., trade). However, I don’t think anyone has large-N data on the actual response to the leader coming to office. Meg Shannon and I were dealing w/ <300 coups, so coding responses didn't take too long. For dem-elected leaders, that would take a while. I'm also not sure if we'd see many negative reactions, so there might not be much variation to analyze. Potentially very interesting, though. Good thought. The military intervention was the only way to return Egypt back to the democratic reform path. Your article has forgotten the milititians are not in power, the give a way to the interim president who declared a constitutional declaration last Monday, The declarations put a timeline for new constitution amendments, parliamentary and spresidential elections, Is this a coup?? Please revise your article. Clearly the Military has shown that they exert power and control over the office of the Presidency by ousting a democratically elected President at gun point. It was the Military that appointed the interim president and have given him powers similar to what Anti-Morsi Egyptians were accusing Morsi of grabbing. It is the Military’s “roadmap” that everyone is following. The Miliary has detained Morsi and is seeking to detain MB leaders. They have arrested hundreds of MB members and are out to rest more. The timeline that the Military appointed Interim President put out was not only rejected by the MB but also the National Salvation Front (NSF) and the main liberal opposition coalition in Egypt. “The National Salvation Front announces its rejection of the constitutional decree,” the liberal opposition said in a statement. The NSF said it was not consulted on the document vital to Egypt’s political transition, demanding changes to the proposal. Who do they think they are to make demands to the Military? Why would they expect to be consulted? Because they supported the Military Coup or something? HA! And look if by some miracle an election is done and a President appointed, that President will be a puppet of the Military under their control. He will have to ensure that the Military is pleased before the people or else he will have done to him what they did to Morsi. And please don’t be naive to think that the Military is there to do the will of the people. HA! The Generals are serving themselves. They will do first what is the their best interest. This is Mubarak’s Military we are talking about here, who enjoy annually 1.5 Billion in aid from the US. The Egyptian Armed Forces also enjoy considerable power and independence within the Egyptian state. They are also influential in business, engaging in road and housing construction, consumer goods, resort management, and vast tracts of real estate. Much military information is not made publicly available, including budget information, the names of the general officers and the military’s size (which is considered a state secret). According to journalist Joshua Hammer, “as much as 40% of the Egyptian economy” is controlled by the Egyptian military. The Egyptian Military is running things in Egypt. And they will run the next President. What happened to Morsi was a Military Coup. WAKE UP. This is a coup because it meets the definition of a coup (as explained in the article). I’m not arguing that coups are necessarily bad, and a forthcoming article that I have with Jon Powell actually makes a very similar argument that you’re making (i.e., coups can sometimes be good for democracy): http://www.uky.edu/~clthyn2/thyne_powell_FPA2013.pdf However, I do not see this as a good coup. There was a process in place by which the people could have changed leaders democratically, and it would have been best to follow this process. Overturning unpopular leaders happens all of the time in democracies–just not usually via a coup. I heard on a French broadcast called C dand l’air (it’s in the air) many prominent talking heads, Robert Sole among others, say that Morsi’s election was the result of election fraud and that in any case, he was elected with less than 25% of the total ballots (don’t hold me to that number, this is off the top of my head), therefore he has no democratic legitimacy. Is this your interpretation? Further, most commentators I heard on the same broadcast also said that Morsi was not pursuing a democratic program but a policy of hijacking political power in favor of the Muslim Brotherhood. Is this statement factual? If so, when does a coup become justified to stop extremism before it has a lock on power? Morsi’s democratic power was reinforced by other public votes. Maglis al Shaab, Maglis AlShoura, his own presidential elections, and by the constitutional referendum. So the Man represents the true choice if the Egyptians. His problem is that he was-and still is, opposed by: a) The deep Mubarak state. The new temporary president was a grade d graduate who was appointed as Chief Justice by Mubarak. B) The media with its own reasons, c) the Judicial system. The supreme court refused the Maglis AlShaab elections for pure minor technicalities, and d) the monarchs in the brethren Arab states. Had this president been in America, we would have had civil war at our hands. The double edged sword though is that the people don’t have the democratic culture ingrained in their life and therefore they don’t cant understand the real value of their vote on their future and the future if their kids. We saw how the stck market in Egypt has improved its performance since rhe coup. This is because billions will pour in Egypt to bring back the “fulool”. I would like to add to the learned commentators that the things cannot be viewed only with the perspective of “virtues” and “evils”. The dynamics of political science differ from region to region. So much so, we should not forget that the world in now uni-polar. There is no check and balance. Summarily, the lesson is that the men with gun and uniform are used for very little interests of their own but the nations suffer for decades. Pakistan can be put the best example for Egypt where also democracy has been obstructed by the military rule. Military first abrogate the constitution which is the power in the hands of democracy like the guns in the hands of armymen. They come for a transition but stay for decades. In the case of recent Egypt the role of liberals is also dubious as they did not show restrain as it was required. Rather they conspired. Let me tell them Ziaul Haq had come in Pakistan for 90 days only and departed till his death after holding power for more than 11 years. His predecessors had the same history. Musharraf had come to eliminate corrupt politicians and ruled for 9 years buying the entire assembly. What would happen in Egypt – Mubarak’s people will plunder the country’s wealth in the guise of Sisi’s men. Rule of Law and democracy have gone away. We should know that the democracy is not a destination but it is travel. I won’t debate the academic analysis drawn from historical data, but, the question here is about relevance… “does it matter at all what these studies call what happened in Egypt?” I say NO, it has zero weight on what we the people of Egypt wanted and determined we want for our country. Call it a coup, or a monkey… we the people didn’t want an Islamist religious rule especially by a group of thugs calling themselves whatever, they are nothing but a terrorist organization with proven history at that. Beside the fact that the hoods cheated in the three polls by various methodologies, the constitution that they wrote tailored to their strategies it allowed their president to call the people to a referendum, and that was the only demand we signed on the 22-millions-signed petition, we didn’t call for his removal, just a chance to vote on his policies, if he had won, he would have still be the president and we shut up. He stupidly and stubbornly emulated Mubarak, we asked Mubarak to remove the Minister of the Interior, he refused, thus, we removed the President himself. The direction both the Hoods and the x-President were taking the country to was not contractual, and the people called the deal off in the streets, even if the poll boxes were not tampered with, the strategic orientation was not declared before hand, so when the first party of the said contract found that out we called for its nullification, whether academicians call it a coup or not,is totally irrelevant for us. We the people are in control here, not any other authority or figure, be it local or foreign if you know what I mean. I hope things play out as you do, Halim. Just a couple of thoughts on your post. First, don’t be offended when we define this as a coup. Coups are not necessarily bad, and then can lead to democratization. Second, the reason that we care that it is a coup is that it’s very rare for coup leaders to overthrow a democratically-elected government and replace it with a better democratically-elected government. The vast majority of the time that the military takes over a democratically-elected government, the military ends up either running the country or at least playing a very strong role in politics. Third, please understand that as academics we must analyze things objectively. That’s the best way to understand how the world works, and the best way to forecast what is to come. When I analyze things objectively, I think that the coup in Egypt was not the best choice. This is based on analyzing previous situations that are similar to Egypt, and I don’t see how others analyzing the situation objectively can come to another conclusion. That being said, when I take off my academic hat and replace it with my personal feelings (as a simple guy who likes to fish with his daughters, drink a few brews, and watch football), I see a lot of strength and courage in the Egyptian people and I admire you greatly. I don’t like seeing the supporters of the MB punished, but I’m glad they’re out of power. In short, you and I hope for the same outcome in Egypt…a flourishing, liberal democracy. I sincerely hope that my academic self is wrong and you are right. It would please me greatly to be forced to revise my theory and empirical models based on the Egyptian experience.